This is the third blog post in a five part series examinaing what I feel are the 5 Essenatial A’s of the Flipped Classroom. The more I think about it, the more I am convinced that the Flipped Classroom offers so many opportunities to assess students for learning. By shifting a proportion of the content delivery away from class time, the flipped classroom allows more opportunities to formatively assess student learning. When we have more opportunities to formatively assess, we are better able to diagnose common issues our students are having with both their understanding of the content and their ability to apply the content. As I’ve mentioned in a previous blog post about accountability, it is so important for students to not just watch videos for homework, but to also complete some form of at-home activity which the teacher can then view. In my classes, I use HSC style questions which my students complete in Google Docs which I have distributed via the add-on Doctopus. Not only does this promote accountability among my students, but it is a fantastic diagnostic tool, to help me understand the strengths and weaknesses that my students have for that particular content area. This information allows me to determine the focus of each lesson, to group students for class activities and to determine which workshops I may offer for the lesson. Having access to the work my students complete at home has been an invaluable tool which has had a tremendous impact on the way I’ve worked with my students. Beginning lessons with a short quiz is a great way to start the learning in flipped lessons. Most of my lessons begin with a short quiz. These are usually only around ten questions long and focus on the core concepts and terminology that are the focus of that particular lesson. These quizzes have allowed me to determine how much student have retained from the pre-lesson content they completed the previous night. There is a lot to be said for using apps like Socrative and Google Forms with Flubaroo to complete these quizzes. They are paperless, maintain records of assessment, can be retaken, and offer valuable analytics. However, although I have and do use both of these apps, I often simply use a paper-based quiz with my students. I usually have the students mark each other’s quiz and then find the correct answers themselves before we have a short discussion about the mistakes or missed content that was common across the class. Commencement quizzes have become a staple for me in the flipped classroom, they are a terrific formative assessment tool for diagnosing common misconceptions and addressing these prior to applying the content during lesson time. With students completing more content acquisition at home, flipped classroom lessons can be far more focused on the application of the content. In my context, we use the flipped classroom as the pedagogical approach for our upper senior students. These students have experienced at least three years of Project and Problem Based Learning, which has significantly enhanced their ability and strengthened their desire to work collaboratively. To take advantage of this, I spend as much time as possible having my students work collaboratively to apply the content they have acquired, through the completion of HSC style questions. 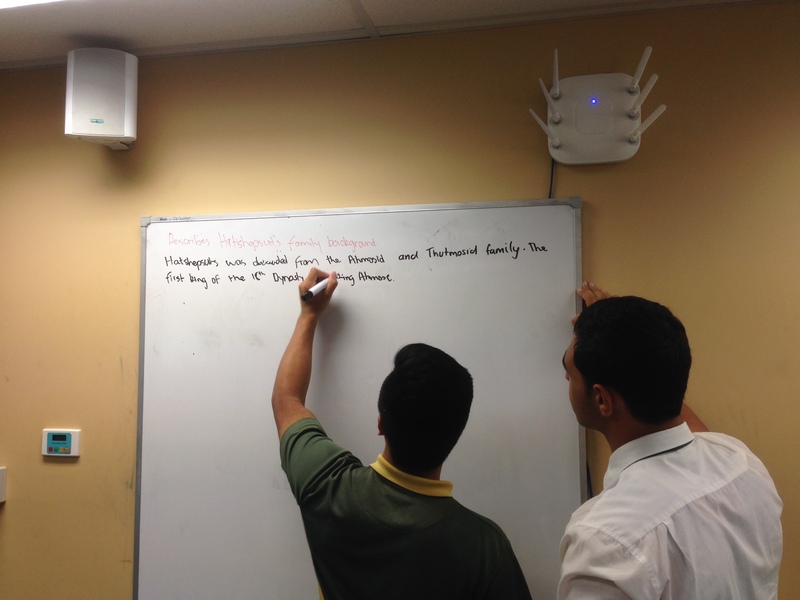 I generally have students complete questions in small groups on large whiteboards, which are located on the walls around the room. Because my role has shifted away from being the content deliverer, my time is free to continually assess the work the students are completing. This has been a tremendous advantage as I have been able to recognise, very early, the common errors that my students are making in both the content and their expression. The opportunity to intervene when I notice issues in student work has been a fantastic benefit of working in the flipped classroom. Although working collaboratively is important, the HSC examination is an individual assessment, which requires students to respond under time constraints. I always ensure that my students have the opportunity to complete some individual written responses, usually involving a time constraint. Peer marking these responses is a great tool for formatively assessing student work as well as building the collective confidence of the class in understanding what constitutes quality work. Often I will take the student responses home to mark. This allows me to provide more specific and detailed feedback to each student and to map their progress as they grapple with the content. The student centred nature of the flipped classroom provides far more opportunities to formatively assess our students. I mentioned before that I use quizzes at the beginning of lessons. 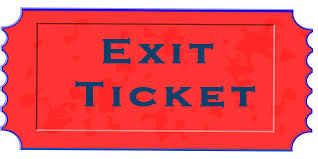 I often also like to end the lesson with a quiz, which becomes an ‘exit ticket’ for students to leave the class. Students will need to answer all questions correctly prior to leaving the class at the end of the lesson. Sometimes I will write a new quick for students to complete, based on the work they have completed that lesson. At other times, I will have them complete the same quiz that they began the lesson with. Occasionally, I’ll dig back into the past quizzes we have completed, other from the current topic or a previous topic. This reminds the students that all content is ultimately assessable and is also a useful tool to determine the content retention rates for the students. Quizzes as ‘exit tickets’ have become another useful assessment tool for use in the flipped classroom. There is no doubting that formative assessment and continual feedback to students is an integral component of student success. For me, the implementation of the flipped classroom, with its clear student-centred focus, has provided for opportunities to provide the detailed ad timely feedback my students need to reach their potential. In the next post in this series, I’ll be blogging about the fourth Essential ‘A’ for the Flipped Classroom: Application of Content. Hi Kurt; thanks for sharing. I’ve shared with the Cerdon PLC Google+ community. Looking forward to other posts. Hi Frank, thanks very much. Hope you’re having a great Easter. I don’t often get the time to read posts but I really enjoyed reading this one and have learnt a great deal from it. Thanks very much for your comments. I’ve gained a lot from reflecting on the work we are doing. Hope you had a restful Easter!